This is definately a first for me. Below is a pic of the very first ATC I've ever made. Over at Mad for Markers (www.madformarkers.blogspot.com), their July challenge is ATC's (using Copics somewhere on your creation). An ATC is an Artists Trading Card, and is 3.5" x 2.5", either landscape or portrait. It was definately a challenge for me to make such a small card. I usually like to fill my cards with flowers and bits & pieces, however I enjoyed making this ATC, and will definately be making some more. What a great way to use up some scrap paper! So hop on over to Mad for Markers today, and create your own ATC. Make sure you check out their blog, as there are some gorgeous ATC's to see. Well, it's almost time for me to pick up my little one from day care. I hope you've all been having an enjoyable school holiays. I can't believe it's almost over!! Wow this is gorgeous, thanks for joining us at 'Mad 4 Markers'. This is GORGEOUS! 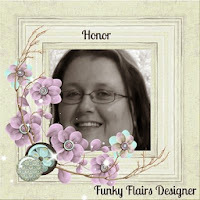 Fabulous ATC Honor and thanks so much for playing along with us at M4M. Honour this is really gorgeous. your colouring is beautiful and I love the design on your ATC. I joined in after seeing yours. Are you going to the copic class on saturday?